Professionals follow latest techniques to offer best Tower Crane Erection Service at the desired place of customers. In addition to this, this presented erection service is completed by professionals in more satisfactory way. Besides this, these offered erection services are quickly completed by professionals. Pooja cranes will do installation and commissioning of Electric hoist, EOT cranes, Gantry cranes for any make. By keeping our track with the developments taking place in this industry arena, we are betrothed in rendering EOT Crane Erection Service. Owing to their exactness, reliability and excellence, our services are widely recommended in the industry. To add, we assure delivering with keen dedication and commitment to our customers. We are capable to present Industrial Crane Erection Service, which are admired owing to timely completion. Backed by our skilled professionals, we are involved in providing Gantry Crane Erection Service. Owing to the wide experience of this domain, we are instrumental in rendering Tower Erection Service to our clients. 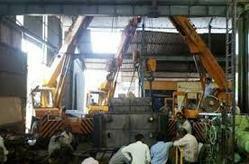 We are a prominent Cranes Erection & Commissioning Services company in chennai. We do Cranes Erection & Commissioning Services in any weight, size and for any application like industrial use, construction etc. We have done our services to big companies in chennai. By using advanced technology, we are involved in providing Crane Erection Service.